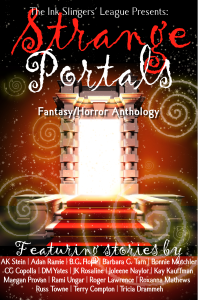 Today's guest is Barbara G. Tarn, author of numerous novels and a contributor to the fantasy/horror anthology, Strange Portals which is currently free on Kindle, Nook, and Smashwords. Welcome, Barb. Can you tell us a little about yourself? Hi, my name is Barb, and I'm write-aholic. I'm so prolific that I'm using 3 pen names, although they're not really necessary at this time... but I'm too lazy to get rid of those 12-15 titles each and put everything under the same name! So, the main pseudonym, Barbara G.Tarn, writes SFF. B.G. Hope writes contemporary stories and some urban fantasy. And Barbara Sangiorgio I keep for the stories set in Italy (at the moment still in Italian, but I plan on translating some soon) – I'm Italian, and I have a bilingual production. Last century, when I entered my teens. I had just come back to Rome after 8 years abroad in French-speaking countries and hated everything about Italy. So I started making up stuff and writing it down. I have two stories – Samantha's Day by B.G. Hope, which shows my witch (responsible for a number of body switches) visiting her "victims" and then meeting the vampires of Amaranthine by Joleene Naylor. I plan to write her meeting with a Desi vampire sometimes this year. The other story, A Bloody Story of Vampires, is the only Barbara G.Tarn's story that seemed to fit the theme of the anthology and isn't tied to the rest of the production.... it's one of my oldest written in English and I wrote it for a friend who had a fanzine (paper and photocopies...) in the late 1990s. The main pen name has a number of books out, set on the world of Silvery Earth. It's adult unconventional fantasy QUILTBAG friendly. Check the Silvery Earth page for suggestions on where to begin. The 25+ titles include a graphic novel as well (I'm a hobbyist artist, that's why you can also find me on DeviantART). The other (shorter) series by Barbara G.Tarn is science fantasy. Star Minds has two books that came out in previous years, the brand new Star Minds Next Generation and I'm currently working on the companion of Next Generation for a March release. So I'm writing science fantasy for the whole of February, then I'll decide if the Desi (and shirtless) vampire has his story ready to tell or I should go back to Silvery Earth (the New one). The new Silvery Earth is under the name of Barbara G.Tarn. The old Silvery Earth, where Samantha the witch lives (when she's not wandering into other universes – books, movies, or alien planets), is under the pseudonym of B.G. Hope. But it's the same person. The name is the same, the world is not. Star Minds Next Generation is available on Amazon Kindle, Kobo, Barnes&Noble, Apple, Smashwords, and soon in print. Amaranthine series by Joleene Naylor. I was stuck to Ann Rice's vampires (Interview, Vampire Lestat and Queen of Damned) when I bumped into Jorick – it was love at first sight (but don't tell Katelina)! And then Verchiel came along... but don't tell him! Excellent recommendation. I love the Amaranthine series. What advice would you offer to new or aspiring authors? Just keep writing. Pour out that million words of crap and keep going. If you have the burning desire to tell stories, just do it! B.G.Hope writes contemporary fiction, including M/M romance. It's the pen-name for a very prolific author who likes to tackle different genres. She lives in Rome, Italy, and hates it. an interview with yours truly on the awesome Trica Drammeh's blog!